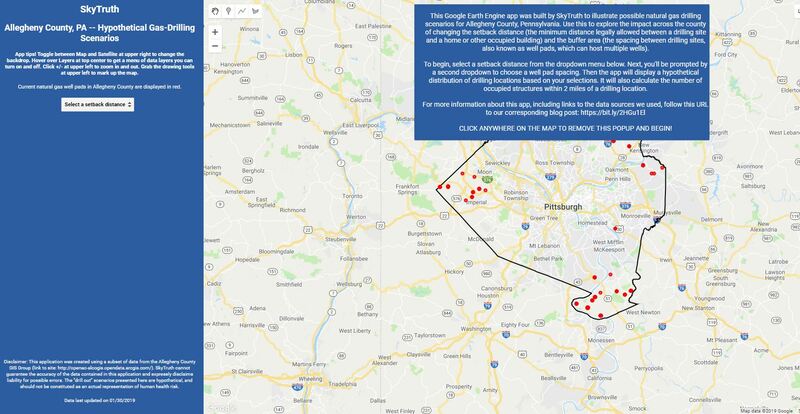 SkyTruth has just launched its first Google Earth Engine app, detailing potential natural gas drilling scenarios in Allegheny County, Pennsylvania. If you’re interested, you can view the app here. Hydraulic fracturing — fracking — has unlocked natural gas resources from formations like the Utica Shale and Marcellus Shale, resulting in an explosion of gas-drilling activity across the Mid-Atlantic states. One of the states sitting above this hot commodity is Pennsylvania; the state boasts a massive reserve of nearly 89.5 trillion cubic feet of dry natural gas, according to the US Energy Information Administration. In the thick of it all, Allegheny County, in the southwestern portion of the state, is one of the few counties where drilling activity has been relatively light. 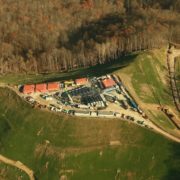 The county’s main defense against well drilling has been zoning regulations which require a “setback” between unconventional natural gas drilling sites and “occupied buildings.” At present, the minimum distance required between a well pad and a building is 500 feet (unless consent has been received by the building’s owner). However, this distance may not adequately protect human health, especially in communities surrounded by drilling. Municipal officials might want to consider alternative setbacks, based on the latest scientific research on the impacts of drilling on the health of nearby residents. This analysis evaluates a range of setback scenarios, and illustrates the likely drilling density and distribution of drilling sites across the county for each scenario. To better understand the potential impact of drilling in Allegheny County, I analyzed several different “drill out” scenarios (Figure 1). I developed our first Google Earth Engine app to give users a glimpse of how different setback distances and different well spacing intervals might impact the number of homes at risk from drilling impacts in the future. Check out the analysis here. Figure 1. A screenshot of the app when first launched. To begin this analysis, I downloaded building footprint data for Allegheny County from the Pennsylvania Geospatial Data Clearinghouse. Next, I downloaded shapefiles representing the centerlines of major rivers passing through the county, other hydrological features in Allegheny County, and county-owned roads from the Allegheny County GIS Open Data Portal. I also downloaded a TIGER shapefile representing Allegheny County’s Major Highways as of 2014, courtesy of the US Census Bureau. Setback distances of 500 feet, 1,000 feet, 1,500 feet, and 2,500 feet were used to buffer the center points of “occupied buildings” in the county. I selected the minimum and maximum setback distances based upon the current Pennsylvania setback laws (500 ft.) and a recently proposed and defeated setback distance from Colorado (2,500 ft.). The latter regulation, if passed, would have been the most restrictive regulation on fracking of any state. The 1,000 and 1,500 foot setbacks are meant to serve as intervals between these two demonstrated extremes of zoning regulation. I also created buffers around rivers and streams as well as roads. I applied a 300 foot buffer to the centerlines of all rivers and streams in the county (based upon the current regulations). I also applied a 328 foot buffer to all major highways and a 40 foot buffer to all county roads. These three buffer zones remained constant throughout the project. After applying these buffer distances to rivers, roads, and buildings, I calculated how many acres of Allegheny County were potentially open to drilling. Using the currently required distance of 500 feet, there are approximately 53,000 acres potentially available for drilling in Allegheny County, PA (See Figure 2). Figure 2: Screenshot from the app showing the available drilling area in Allegheny County (shown in grey) when considering the 500-foot setback from occupied structures. Current well pad locations are denoted by red points on the map. So, for example, a setback distance of 500 feet coupled with a spacing between well pads of 40 acres would allow for 928 new potential drilling locations. Taking into consideration the approximate 3-5 acre area required for the development of a well pad, this suggests that 2,700-4,600 acres of land in Allegheny County could be subjected to surface well development. Figure 3. Screenshot from the app showing potential drill-out locations (shown in yellow), considering a 500-ft setback from occupied structures and a separation between potential drilling operations of 40 acres. Notice the area of the county potentially subjected to adverse health consequences considering a two-mile buffer zone (shown in black) around each of these locations. Setback distances can be an important tool for municipal governments looking to reign in drilling to protect the health, safety, and quality of life of local residents. My analysis demonstrates how setback distances can help protect the public from the adverse impacts of oil and gas drilling in Allegheny County, Pennsylvania. Please be sure to check out the app here. Near the northern tip of Indonesia’s Bangka Belitung Islands (located directly below the yellow box within the inset map of image 1), I spotted a slick that resembles clock hands pointing to the hours 4 and 11. Captured by radar satellite, Sentinel-1, on the evening of January 8, 2019 (22:40 GMT), the slick stretches at least 117 kilometers. Due to the slick’s narrowness and distinct sharp turn in track, it is likely a bilge dump. To the right, the slick trails beyond the edge of available imagery. 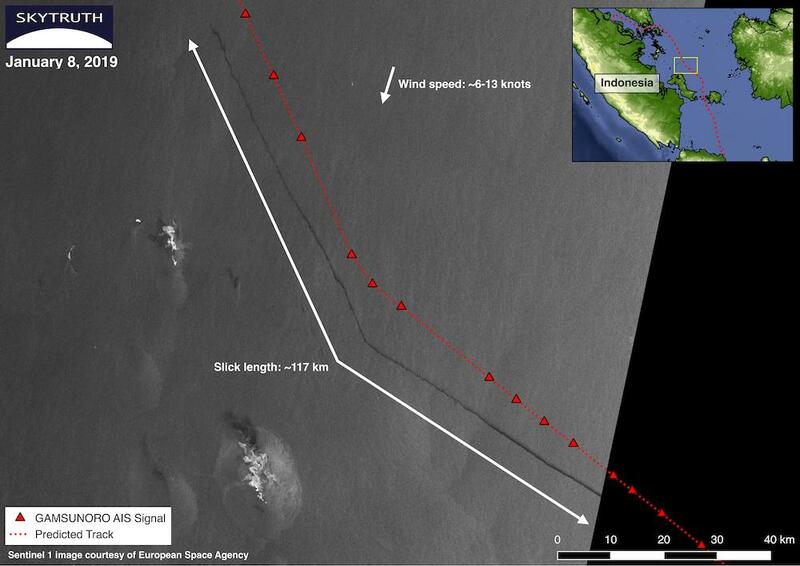 Though we cannot see the responsible vessel on this image, the sharp linear impression of the slick indicates that it probably passed through the area within 24 hours of the scene’s capture. Image 1. Sentinel-1 scene of slick approximately 50 km north of Bangka Belitung Islands. See text for explanation. SkyTruth analyst Bjorn Bergman verified this presumption. 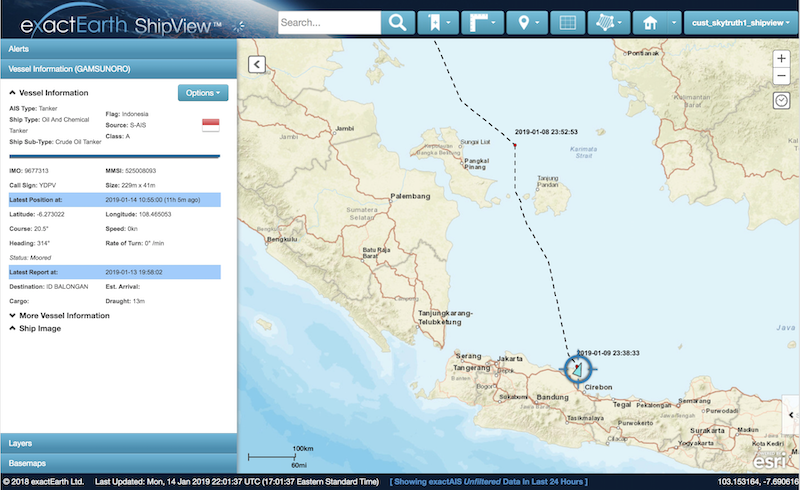 To look for similarities in timing and trajectory, Bergman used ExactEarth’s ShipView, a web-based platform that provides access to automatic identification system broadcasts (a global vessel tracking system commonly abbreviated to ‘AIS’), and identified the Indonesian crude oil tanker GAMSUNORO as a possible source. Image 2. ExactEarth ShipView displaying AIS signal of tanker GAMSUNORO. Credit: Includes material © 2019 exactEarth Ltd. All Rights Reserved. Image 3 juxtaposes the slick and GAMSUNORO’s AIS signal. Traversing southeast, the ship’s first signal was recorded at 12:59 GMT. 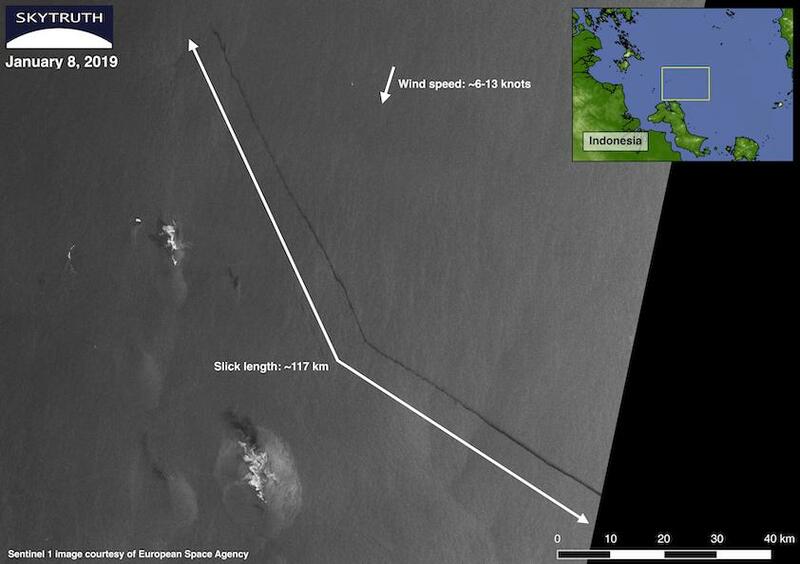 Close to 14:00 GMT, the vessel encountered the area with the slick. From this information, we know the tanker’s predicted track occurred approximately 8 ½ hours before the scene was captured. In addition, the vessel’s path imitates the shape of the slick. 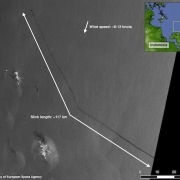 However, the ship’s track is slightly displaced to the northeast. It is possible that the slick may have drifted due to steady winds blowing from the NE (~6-13 knots) at least seven hours prior to the image’s capture. There appears to be a strong correlation in the temporal and spatial attributes of slick and ship, indicating that the GAMSUNORO is a likely source. To corroborate our findings, we followed the ship as it sailed southbound. Initially, we anticipated the ship would journey to Jakarta; however, image 2 displays the vessel’s latest position (January 14, 2019 at 10:55 GMT) anchored about 6 miles offshore near the town of Indramayu. With an updated version of the vessel’s track, we may be able to find evidence of a continued slick either on their way south or at their current anchorage. Whether or not we are able to positively ID the perpetrator, this is one of many examples displaying the temporal challenges of using satellite imagery to capture not just illegal activity but any short-lived phenomena. 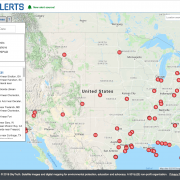 We just released a new version of SkyTruth Alerts, a service that notifies you about environmental incidents in areas you care about. It’s a tool we built to help us monitor environmental events in-house, and we’ve made it freely available to the public for the last six years. I used the original Alerts. Do I need to do anything to switch? You don’t have to do a thing to continue receiving the same alert emails you’ve always received, although you’ll notice the emails have a new format. You can still view a specific alert by clicking on its link in the email. If you want to add or change the areas of interest (AOIs) you monitor, or fine-tune the alerts you see or get emails for (a new feature), we now ask you to create an account. We only collect your email address, which we need to send you emails. We have plans to add features in the future that will also need a user account in order for them to work. OK, so how do I register for an account in the new Alerts? Go to SkyTruth Alerts and select Login from the burger menu. If it’s your first time here, click the Register here link to create an account. The original Alerts worked fine! Why did SkyTruth create a new Alerts? Web-based software has a pretty short life-span and the first Alerts system was getting harder and harder to maintain. Additionally, SkyTruth wanted to expand the number and types of alerts that we were saving as well as work on new features such as notifying subscribers when there is a change in their AOI. It became clear that the original Alerts wouldn’t be able to handle these additions. Does the new Alerts do everything that the original Alerts did? Almost! We’re still working on the API that a few subscribers used to integrate alerts with other software. If you spot anything else that we missed, please let us know by emailing us at feedback@skytruth.org. Until we have the API fixed, we’ll keep the original Alerts available at https://alerts1.skytruth.org. Note that this should only be used for redirecting the API and embedded links in KMZ/KML files. If your KMZ file contained a link to https://alerts.skytruth.org, you can still get it to work by pointing to https://alerts1.skytruth.org. What major new features should I know about today? You can filter the alerts you receive emails for. You can filter the alerts shown on the map by type and date. You can create AOIs that are polygon shaped. You can choose a pre-defined AOI. Currently, we have states and counties ready and are working on more. Can you add alerts from other websites? Yes! Let us know what a useful source for alerts would be and we’ll consider it for the future. That email again is feedback@skytruth.org.